Coconut flour is a tasty real food ingredient in many baked goods and recipes. Using coconut flour is helpful for those who need to reduce or eliminate gluten or grain in their diets, but may not want to use nut flours. 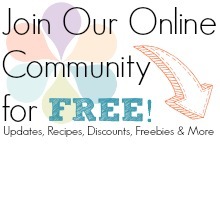 Here are over 80 recipes for grain free goodies using coconut flour, including muffins, cakes, brownies, crackers, rolls, biscuits, crisps, pies, recipes for breakfast, lunch and dinner, and even tutorials on how to make your own coconut flour! I really hope that you guys find some new favorites among all these amazing recipes! I’m trying to find a recipe for a yummy coconut &/or almond flour sandwich bread that doesn’t taste eggy!! I made the Wheat Belly recipe & all I could taste was the eggs!!! Help please, don’ t like wasting ingreds. So far my favorite bread recipe that is GF is a Brown Rice Loaf. I know it has nothing to do with coconut but it is by far the best sandwich bread loaf i have tried thus far! Never disappointed! Here is the link.